New Net City is an arcade cabinet from Sega. This is the best cabinets for the Naomi game system. New Net City is Jamma standard, plus a sleek and stylish form. It uses the standard Japan Sega control panel, easy interchanging panels design. 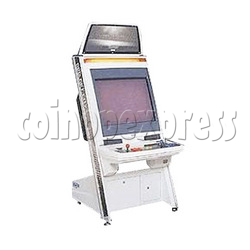 The cabinet has JVS wiring, and a 29 inch 15/24/31 kHz monitor which is able to be rotated and suitable for all kind game system.